He sought the wisdom of God; detached himself from society; disfigured for sake of others; a person of sorrows and suffering; an apostle to victims of leprosy; he was counted among the outcasts in order to care for them. That was Saint Damien de Veuster who left everything in his native land of Belgium and came to Hawaii as a young novice of the Sacred Hearts in 1864. He was ordained a priest of the Sacred Hearts in May of that year at Our Lady of Peace Cathedral, Honolulu. After 9 years committed himself to what nobody else wanted to do, to care for people with leprosy at Kalaupapa in Molokai. By his heroic sanctity of life, he configured himself to Christ and persevered in such terrible conditions. St. Damien identified himself with victims of leprosy to give human suffering a new meaning in the light of the passion, death and resurrection of Jesus Christ. What sustained him is holiness of life and living in the presence of God. At the end of his life he wrote to his brother, “Were it not for the constant presence of our divine Master in our humble chapel, I would not have found it possible to persevere in sharing the lot of the afflicted in Molokai.” (Letter to his brother). In letter of November 1873, Father Damian wrote: “As for me, I make myself a leper with the lepers to gain all for Christ. Because of this, when I preach I normally say, ‘We lepers’…When I go into a hut, I always begin by offering to hear their confession.” By the time Father Damien died in 1889, people came to know that human compassion could lessen the terrible suffering brought about by this disease. He was truly a person for others. Saint Damian of Molokai canonized on October 11 2009 by Pope Benedict XVI. 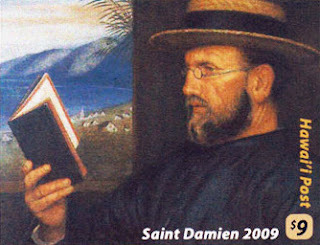 Saint Damien of Molokai, patron of outcasts, Pray for us!